Blending the rugged beauty of a mountain retreat with all of the modern conveniences, Red Wolf Lakeside Lodge offers the perfect place for your next outdoor adventure. 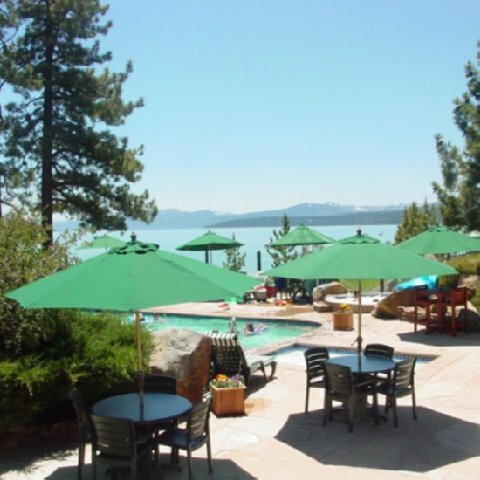 Located on the north shore of Lake Tahoe, Red Wolf Lakeside Lodge is close to every type of outdoor recreation. From water skiing on the lake in summer, to downhill skiing on the snowy peaks in winter, you will never find a more beautiful place to enjoy the outdoors. . The resort includes a seasonally heated pool which overlooks the lake, a spa for relaxing away your cares and cozy fireplaces for warming up after a day on the slopes. From romantic getaways to family vacations, Red Wolf Lakeside Lodge is the ideal retreat. This is a non-smoking property. Smoking is only permitted on the patio and may not interfere with the privacy of other guests. The resort will undergo a pool renovation from May 1 to July 5 (tentatively). During this period, the resort?